The Demise of the Penarth Ship Building & Shiprepairing Company Limited. During continued research at the archives of the National Museum of Wales at Nantgarw, I came across an extensive 58 page document entitled 'The Development of the Ship Repairing Industry in Cardiff 1820 -1920.' [National Museum of Wales item : 2002.184/1] The author of the document is not known. 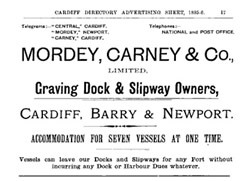 The text states that the Penarth Ship Building & Shiprepairing Company was wound up in 1895 when the slipways and works were taken over by Mordey, Carney & Co. Ltd. of Newport. In 1895 it is well documented that they took over the Windsor Slipways Dry Docks and Engineering Co., Cardiff. Whilst the last paragraph is plausible, I have a problem with the statement that the Penarth Ship Building & Shiprepairing Company was wound up in 1895 and the slipway and works taken over by Mordey, Carney & Company. I believe the author has mistaken the company and location, and that, as stated above, they took over the Windsor Slipways Dry Docks and Engineering Company in 1895.